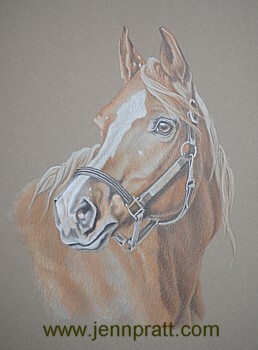 Freckles Continued | Jennifer Pratt Equine Artist. I’ve added a few more layers to Freckles. Still plenty more to go. I will work until the paper is saturated with colour. Patience is key. You cannot rush and apply any layers too strongly, otherwise the paper will become saturated too soon and limit the number of layers you can continue to add. I use at least 15 different colours in my layers. Tedious yes, but in order to have a rich finish to the final work, it is necessary.